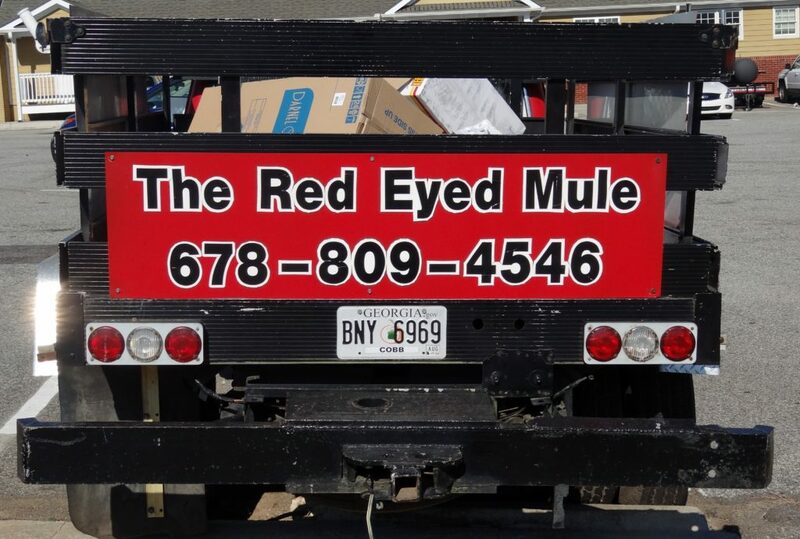 HIDDEN GEM RESTAURANT CHALLENGE #2 RED EYED MULE IN MARIETTA, GA: Grab Some Napkins and Go to the Red Eyed Mule! What do Alton Brown, Guy Fieri and the Picky Peaches have in common? We all love Jake’s Sloppy Slaw Burger at the Red Eyed Mule in Marietta, Georgia, which just happens to be the second stop on the Hidden Gem Restaurant Challenge. 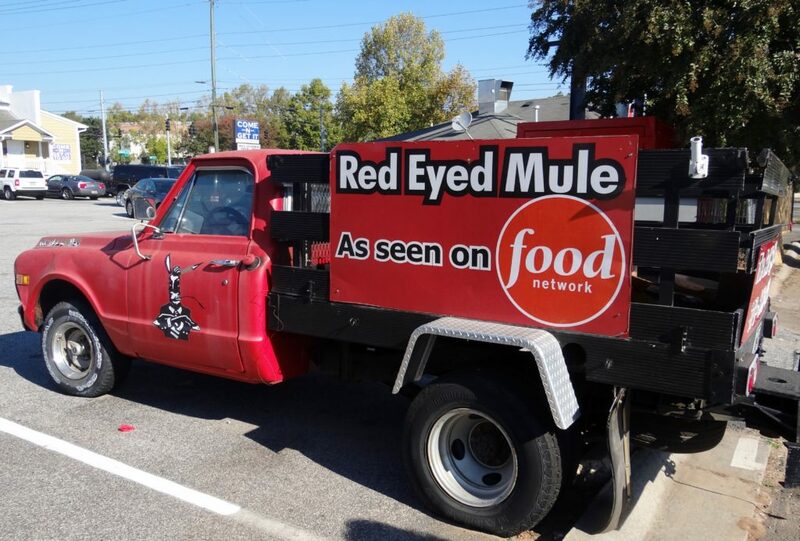 Opened in 2010, the Red Eyed Mule looks and feels like it’s been around much longer. When you drive up to the red brick building, located near Kennestone Hospital, you may be puzzled by how small it seems. The building may be small, but the flavor inside certainly isn’t. There’s plenty of parking and you can enter the building through the front door or through the back door. 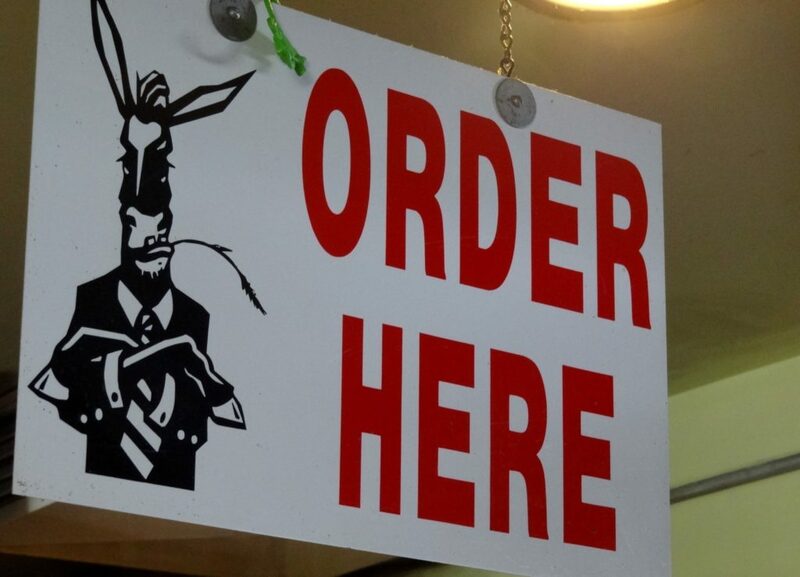 Once inside, grab a menu and get in line at the cash register to place your order. Then grab your drinks and find a seat. You may need to get cozy and meet new friends, but that is a part of the experience. You can sit inside or out, depending on the weather. There’s no pretense here. 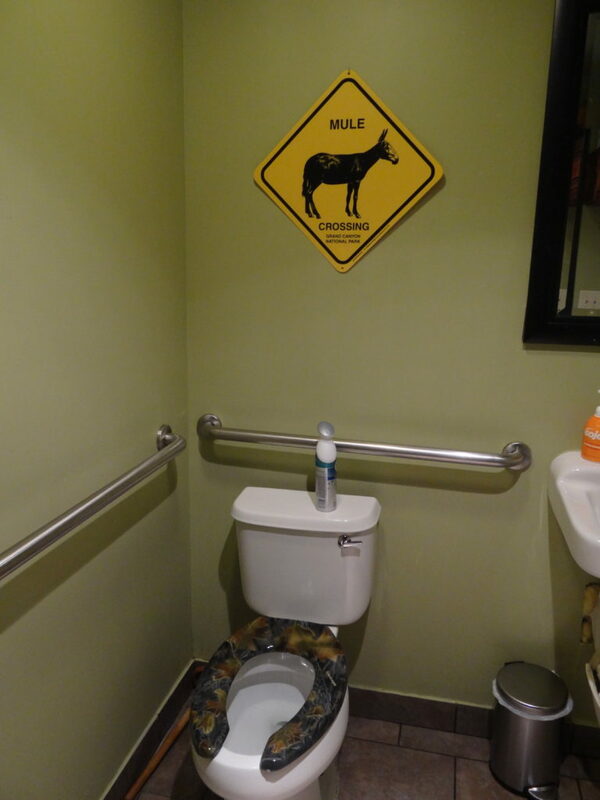 The friendliness will make you feel right at home. You know how every small town has that little restaurant that always has the sheriff’s deputy’s car and a row of pickup trucks parked out front? Well this will remind you of one of those places except for one major difference. The quality of the food at the Red Eyed Mule is much, much better than any of those places. The menu is short and simple. Simplicity enables the Red-Eyed Mule to focus on quality. The Morning Menu is available until they run out of breakfast items. When we got there around 10:30 a. m., they’d already served the last helping of grits and the last fluffy, homemade biscuit. If you’re going for the biscuits, which we’ve heard are some of the best around, we encourage you to get there early. Once they’re gone, they’re gone for the day. 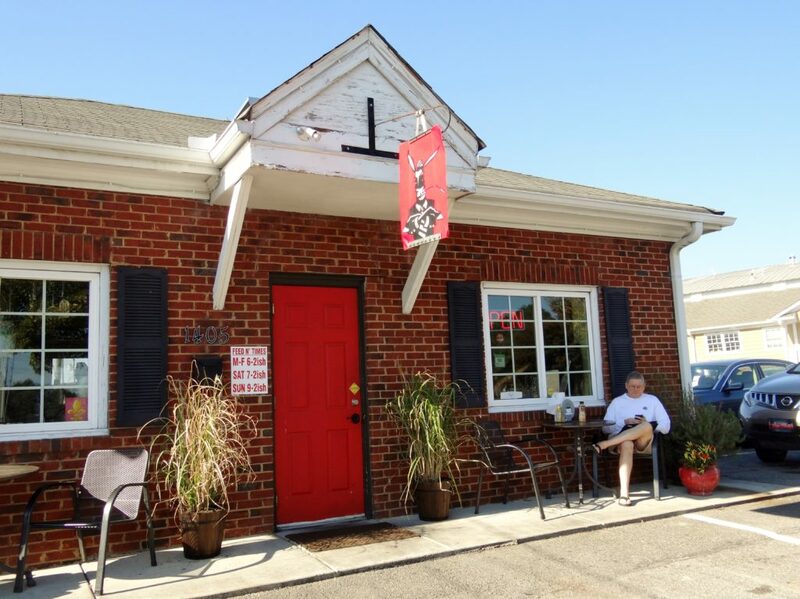 They also serve scrumptious breakfast sandwiches or biscuits filled with country ham, bacon, sausage or eggs. You can even get white gravy or Red Mule Gravy. The After Morning Menu focuses on mouth-watering burgers, BLT’s and sandwiches. The homemade chicken salad is very popular, but the burgers are the stars of this menu. 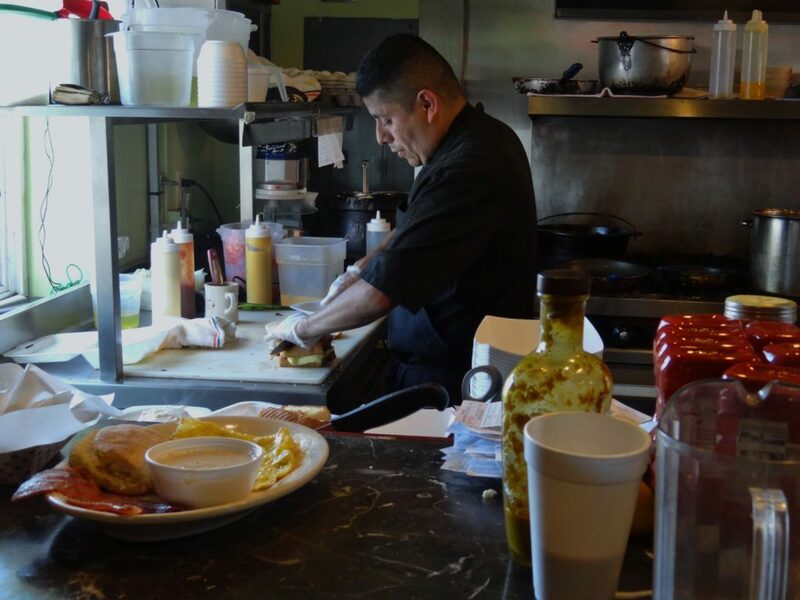 All the burgers are made with 6-ounce, fresh, never frozen, Black Angus ground chuck served on grilled, buttered Texas toast. 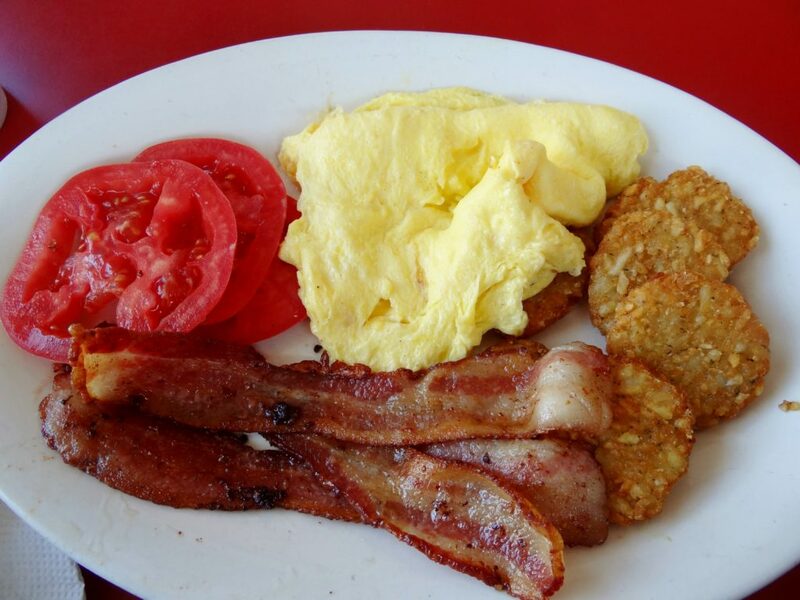 If you’re looking for a big, hearty breakfast, try the Two eggs, Bacon or Sausage, Grits and a Biscuit. Served on a platter, the scrambled eggs are fresh and fluffy and the bacon is thick-sliced and tasty. Since they were out of grits and biscuits by the time we arrived, we requested sliced tomatoes and mini hash brown patties as our substitutes. Even though it was very late in the season, the tomatoes were red, juicy and flavorful. The little hash browns were crispy and piping hot. The next time you’re in the mood for a burger, this is the place to go. Order the Jake’s Sloppy Slaw Burger and grab some extra napkins. You’re definitely going to need them. It’s big. It’s messy and it’s delicious. Alton Brown calls it his favorite Atlanta burger. He even featured it on “The Best Thing I Ever Ate” on the Food Network. 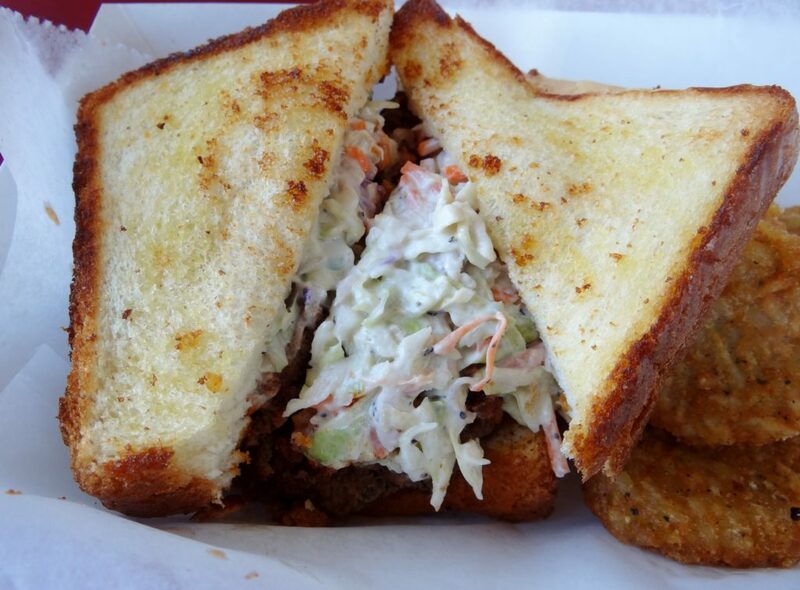 Served on a heap of slaw with Sloppy Jimmy Sauce sandwiched between two slices of grilled, buttered Texas toast. What’s Sloppy Jimmy Sauce? It’s the Red Eyed Mule’s tasty mixture of ground Black Angus chuck, ground chorizo, chicken broth and spices. Yes, you do want fries with that. Choose either regular or sweet potato. Both are so good. They also serve crispy onion rings. Warning: Make sure to wear machine washable clothing. It’s that messy. There will be finger licking involved. If you just can’t bring yourself to get that messy, try Jake’s Big Daddy Burger which comes topped with a fried egg and Sloppy Jimmy Sauce. We’ve heard it’s delicious too. Beverage selections include Coke products, Boylan sodas and Jarritos sodas, but the Picky Peaches encourage you to get the iced tea. 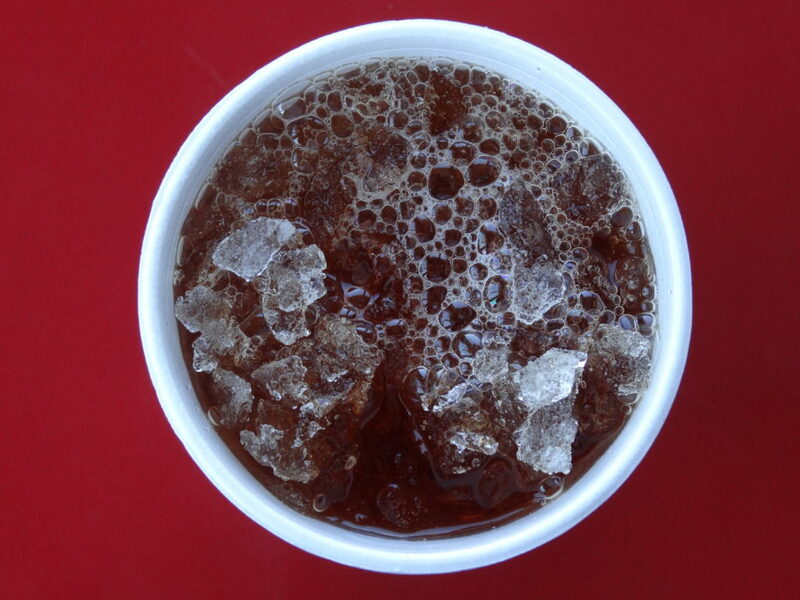 Poured over crushed ice (none of those weirdly shaped cubes that cause you to end up with mostly ice and not much drink), both the sweet and the unsweetened tea are fresh and crisp, but what really impresses us is the fact that the tea is made to anticipate the watering-down caused by melting ice. So refreshing! 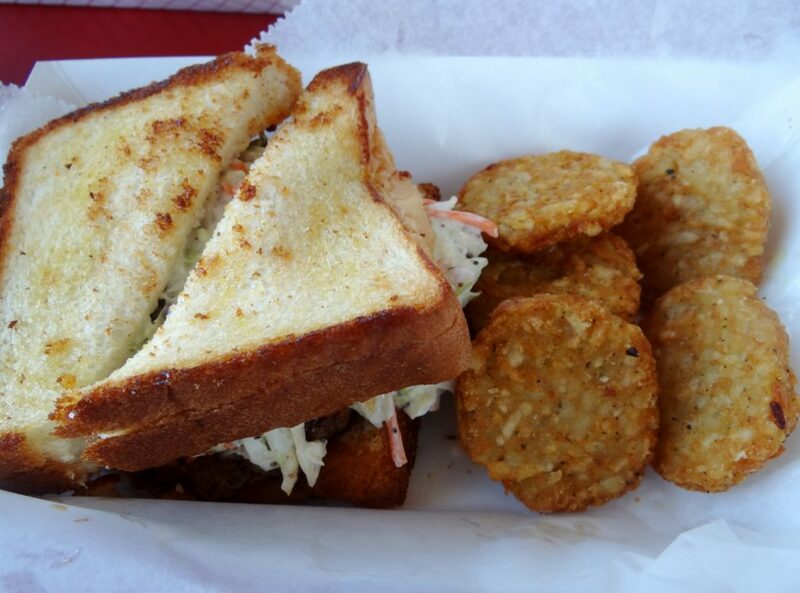 Put on your jeans and bring your man-sized appetite and we promise you’ll get your fill. 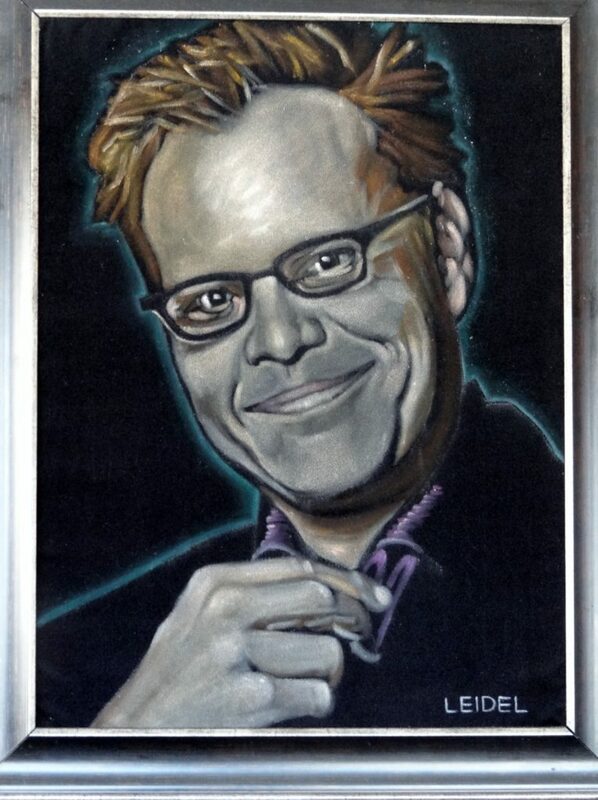 You may remember the velvet painting of Alton Brown and the camouflage toilet seat, but you’ll come back for the hearty food and warm hospitality. Overall, the Red Eyed Mule is a culinary and cultural experience you don’t want to miss! Psst–We’re not kidding. The very clean restroom does have a camo toilet seat. Hours: Monday-Friday 6 a.m. – 2 p.m.; Sunday 9 a.m.- 2 p.m. Check back with us in 3 weeks for NEW material! Love and Peaches! 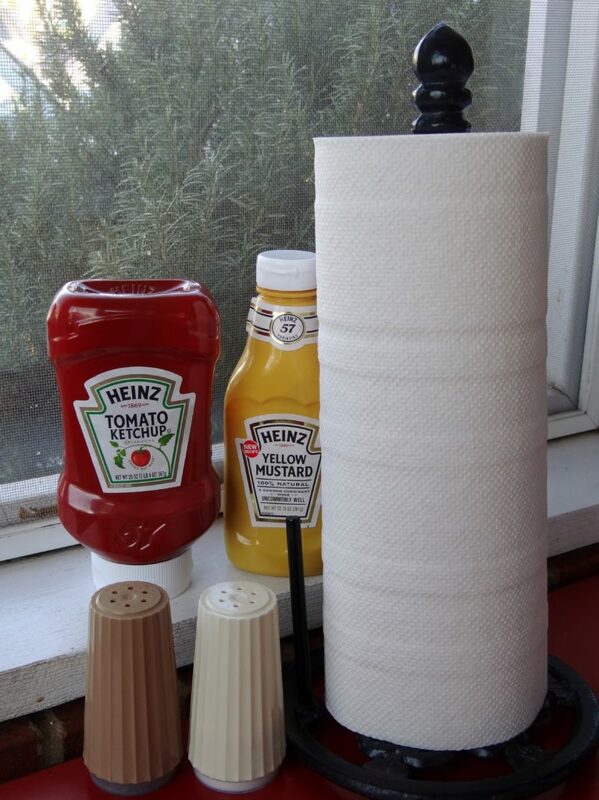 This sounds like my kind of place….love slaw burgers! Thanks for the heads up…. You’d love it! The burgers really reminded me of burgers I’ve had in the Piedmont area of NC! Thanks for following us! Oh my gosh…I’ve got to go there and eat! I’m drooling after seeing the pictures and think I would LOVE the casual, country style you described. Thanks again, my PP girlfriends! Woot! Wear clothes you won’t mind a drip or two! Thanks for reading our blog! Thank you Millard! 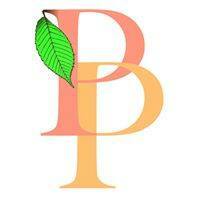 Hope you keep reading Picky Peaches!